I am in the movies! Okay, not the big screen. More like the little screen—say, the size of your computer monitor. 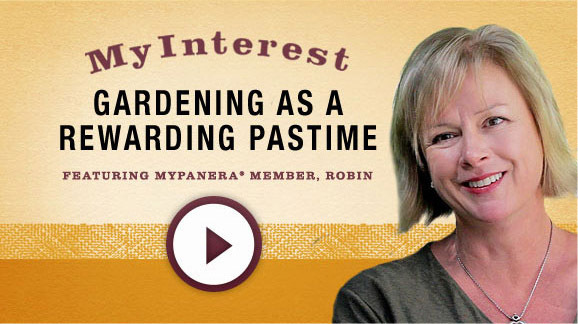 I and my garden are the subjects of a video and Q&A story for Panera Bread’s new website and to promote their new “Live Consciously” campaign. (Update: The story and video have moved temporarily off the Panera website while they move things around. You can still see the video here on the Panera Youtube channel. Well, it was evening when I opened the email. I maybe had a glass of wine. Maybe two. I figured, “Hey, I’ll tell them I garden!” So I filled out their online form and rather than providing them with a bunch of answers to their open-ended questions, I referred them right here—to my garden blog. Months went by and I didn’t hear anything. Frankly, I forgot about it as soon as I hit send. After all, gardening isn’t exactly an unusual hobby. Surely tons of gardeners wrote to tell the Panera folks about their rose gardens, their perennial gardens, their exotic gardens. There was a bit of back-and-forth and a few weeks later two videographers, an art director and account executive flew in from Boston and other parts north for a visit. They were at my house for nearly seven hours! For a two-minute video! 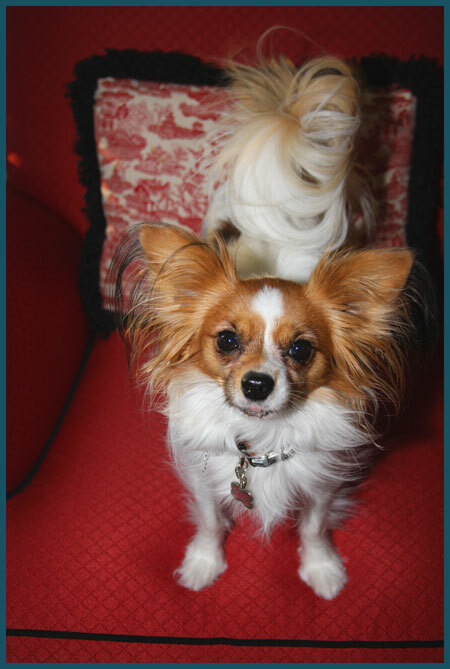 The older of my two Papillons, Sophie, was delighted at the opportunity to be in the movies. Sophie is one smart dog. She’s not the kind of smart dog who will do tricks. She’s the kind of dog who knows exactly how to make you do tricks. During the interview portion of the shoot, which took about 20 minutes, Sophie sat right next to me, ears up and with her best I’m-ready-for-my-closeup smile on her face. Sarah was busy sniffing camera bags and cables. Sophie, the elder Papillon, never made it into the video. Neither dog made it into a single shot! The videographers were keen to see me work and move around, which was more than a little uncomfortable. The weeding was fine. I’m used to weeding. Sitting on my little stool and scratching out the unwanted weeds is as natural as breathing for me. But having two guys with cameras follow me around as I walked in and out of the house, potted up a little plant, pick lettuce? Believe it or not, that’s not something I do every day. It was a wee bit uncomfortable. But it wasn’t until I watched the video that I realized my unfortunate wardrobe choice. Mom jeans. I was wearing mom jeans. Seriously? I had to wear mom jeans when people came over with cameras? What was I thinking? Ugh. Watching the video now I also see how barren and new my first-week-in-June vegetable garden looks. The camera dudes were uninterested in my hosta garden. The wisteria, peonies and roses had just finished their big display. But really, they were interested in the fruits and veggies. And the eastern box turtle. 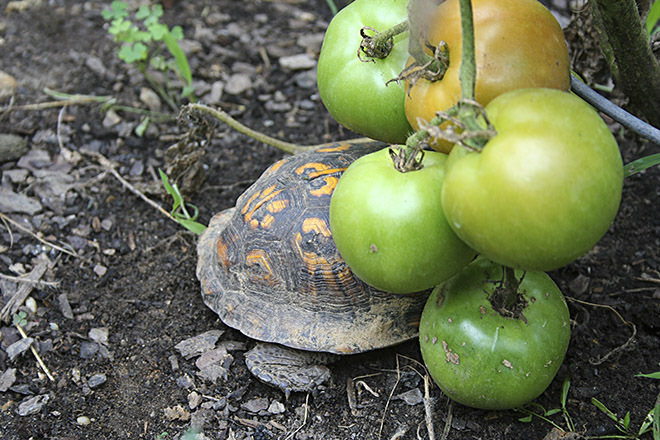 The eastern box turtle is the resident tomato muncher—and runaway star of the garden video. Well, no. The turtle actually has me. I am his personal gardener. I’m pretty sure this is the same box turtle who has lived in the garden for about three years now. I often stumble across him as I’m digging and planting, watering or weeding. I know he’s the one who takes bites from low-hanging tomatoes because I caught him red-handed one day, front legs on a big red tomato and mouth open. I’m sure he’s the guy who nibbles at my strawberries too. That’s okay. I planted extra for him. So, here’s the video. Watch for the shot of the turtle. No comments on the mom jeans, please. Fun video Robin. The turtle was cute. Really nice video! The turtle was really moving, your jeans were fine -(totally realistic), and the garden was beautiful! Finally! A realistic video on gardening! Mom Jeans? You wear them well and what else would be appropriate in the garden? The garden looks lovely and I wonder what your pet turtle has named you and the pups?